Engaged Citizenship Through Service Learning 1 and 2 are each new half-credit classes that will be taught by English teacher Brie Shannon. The courses aim to raise students’ awareness of the community and their position in it through meaningful projects, while helping students earn community service hours that can be used toward the Bright Futures scholarship and National Honors Society. 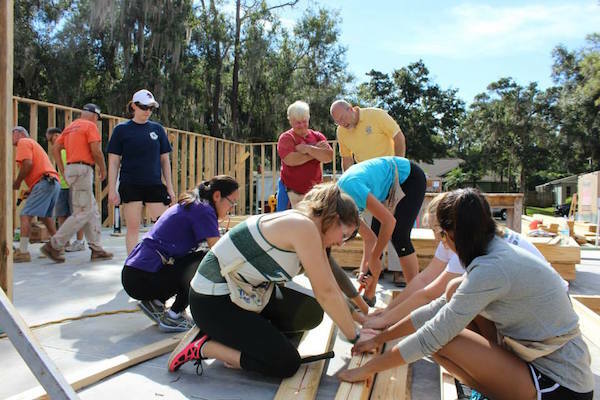 The first semester of the course focuses on advocacy, having students create action plans and earn up to 30 community service hours, while the second semester is targeted to direct service projects for the community. In this second semester, students can earn up to 45 hours. “It will begin with students figuring out their own position within the community… Then they’ll go from there to learning how to develop a community needs analysis and writing action plans to create the systemic change they identify a need for, and in some cases,working with local organizations that have started to serve those needs,” Shannon said. Another option referenced on the survey was trying to encourage more high school students who start school in periods one or two to choose a lunch period in the middle of their day. The midday lunch already has been a possibility, but is usually overlooked. This survey option came as a response to administration hearing several students who would be interested in taking a break from their day for lunch, opposed to attending classes straight through. “I really hope students take advantage of the opportunities they have in front of them. If that means making sure [students] eat a lunch, then we’ll create a schedule that allows students to do that,” Principal Dr. Stephen Covert said. Also mentioned on the survey was whether or not students would be interested in a new class: AP Seminar. The course would go hand in hand with AP Statistics, teaching students skills for conducting and analyzing research by themselves and in groups. The class would have a following level, AP Research, in which students would conduct a yearlong research project about a particular topic of their choosing. Students would create a paper and oral presentation that could be presented at national conferences. AP Seminar is rarely seen, with less than 20 high schools in the nation offering it beginning this school year. AP Research will appear in schools later this fall, since students must complete it’s previous level, AP Seminar, in order to enroll. Although not offered for the upcoming 2015–16 school year, interested students may be able to enroll in the entry level AP Seminar for the 2016–17 school year. “[AP Seminar and Research] seem pretty cool… they give students the opportunity to gain knowledge on one specific topic and gain a college level understanding in high school,” ninth-grader Alex Anacki said. As for other schedule changes, eighth-grade students will, after receiving teacher recommendation and administrative approval, have the option of taking Biology 1 Honors, normally part of the school’s ninth-grade curriculum.